Detailed account of the early years of the Bab, events of the 1880s and 1890s, the Constitutional Revolution years, and appendices for the study of the Baha'i community in Shíráz. Published by Brill as part of the "Numen Book Series Studies in the History of Religions: Texts and Sources in the History of Religions," volume 122. Order a copy from brill.com. Preview it at google.com. Also available as a Word document. 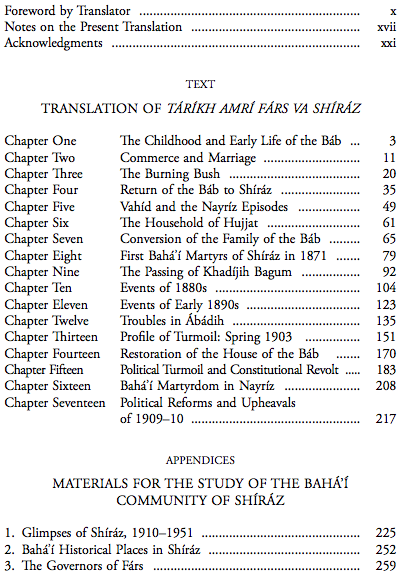 See also Habibullah Afnan's Memories of the Bab, Bahá'u'lláh and Abdu'l-Bahá: Autobiography of Mírzá Habíbu’lláh Afnán, and a shorter version of this history, The Báb in Shiraz: An Account by Mírzá Habíbu'lláh Afnán. edited and translated by Ahang Rabbani. Because this PDF is large — 426 pages and 3MB — it is not automatically displayed on this webpage. Click here to download it: afnan_rabbani_genesis_faiths.pdf.